$0.89 CDN AD-L Clip For Stem Thermometers Stainless Steel 7"
Use the CDN PW70 Thermometer Probe Wipes to clean thermometers and probes after use with meat or poultry. 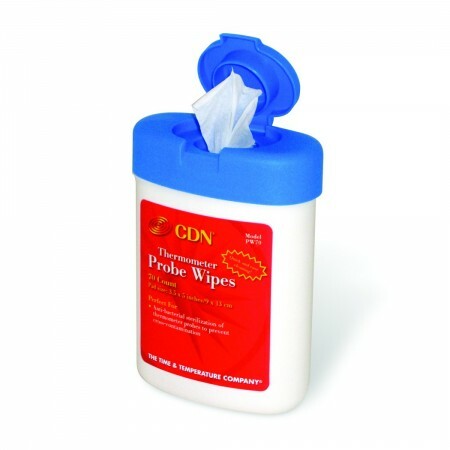 Each wipe is saturated with 70% Isopropyl Alcohol to disinfect the probe and prevent cross-contamination. Designed for convenience, these anti-bacterial wipes are packaged in a convenient pop-up container.